The health care system works well when it works. The main problem now is wait times for procedures that are not deemed urgent/critical. Things like physiotherapy are private (pay yourself if you don't have insurance) and not covered by the public system. An example of how the public system works well is Mrs TDs recent procedure at the Heart Institute ... all costs covered by the government system (actually by the taxpayer). So their are pros and cons to the public health care. With my bad knee I was able to hobble around my workshop and even went shopping with Mrs TD. 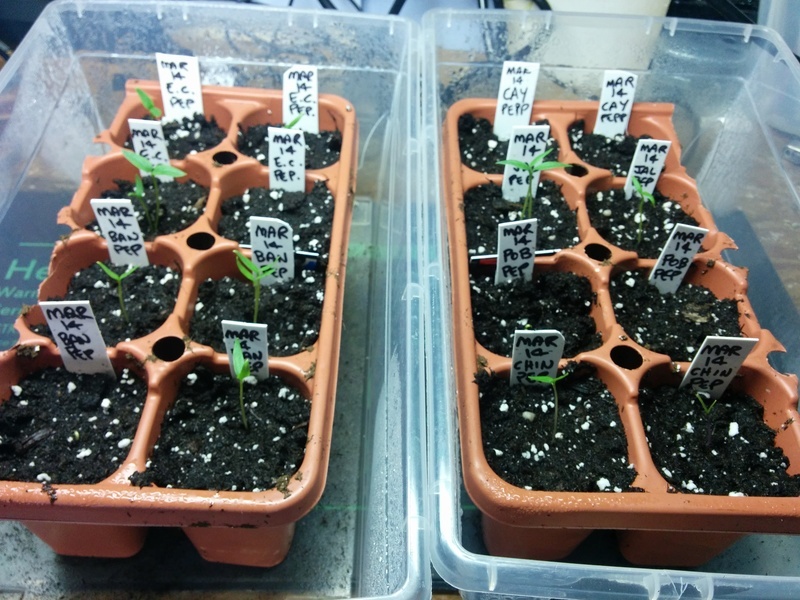 First, up are photos of new life in my indoor sowing trays ... an Early California Wonder Bell Pepper and a Jalapeno Mild Pepper. These were started seven days ago and are on a heat mat at about 80F. 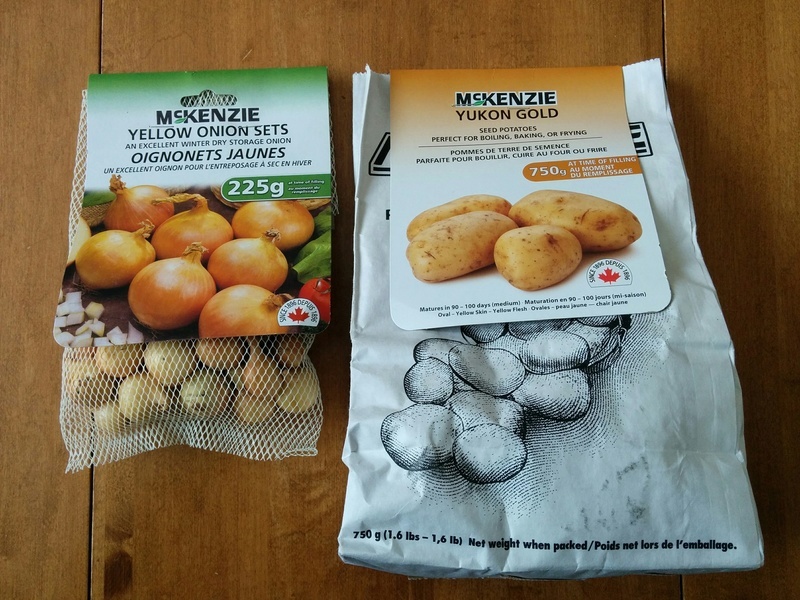 Next is today's purchase of Yukon Gold Seed Potatoes and Yellow Onion Sets. 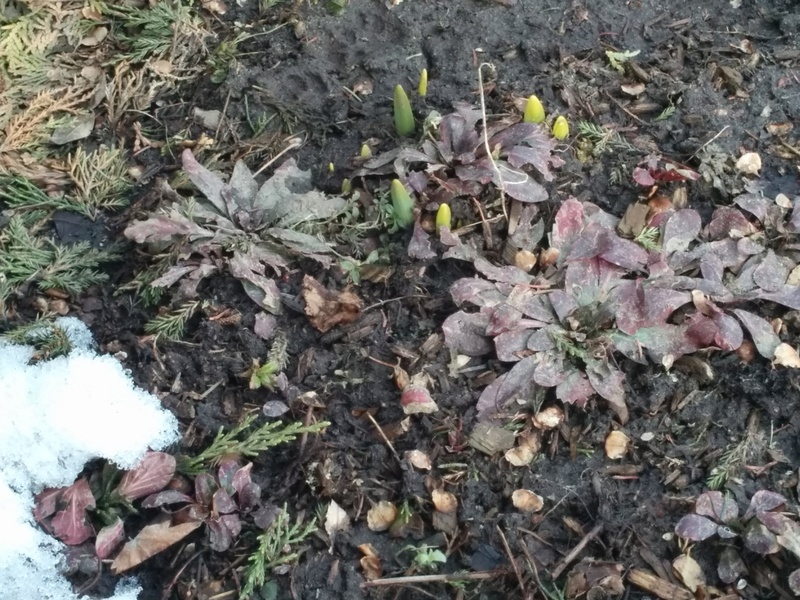 And now for something that thrilled my heart today ... a sign of new life (middle top) outside in the front garden ... either daffodils or hyacinths I think. There is a small patch of snow in the bottom left corner but the front lawn is still covered in snow. 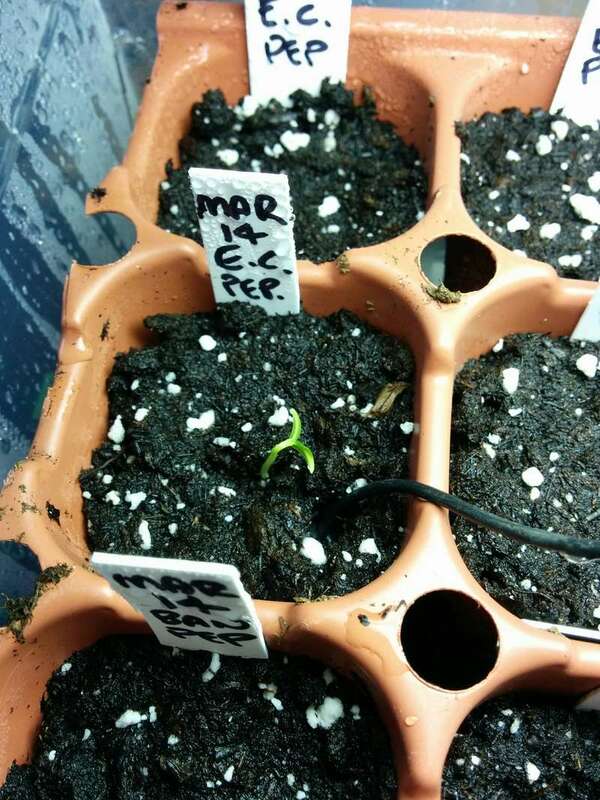 Most of my Peppers have sprouted so I have moved them under the grow lights. 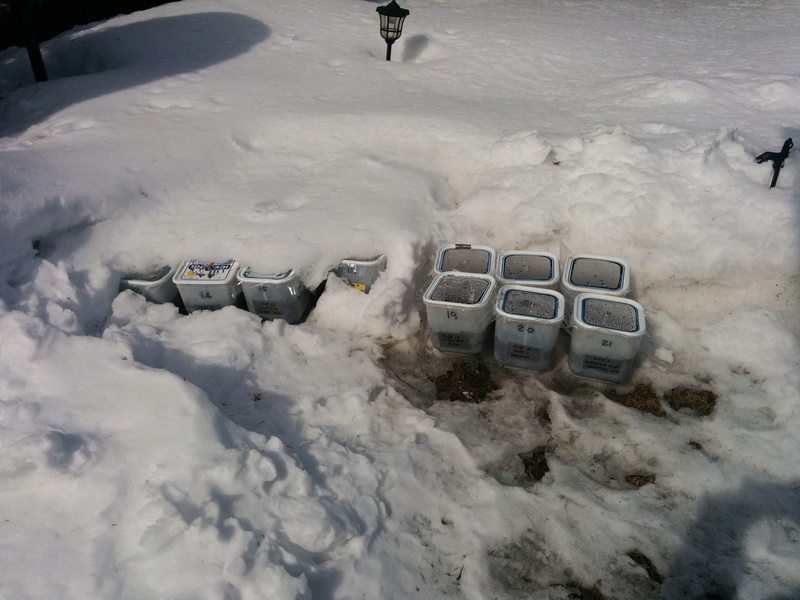 I have 21 Winter Sowing containers (all flowers) outside and over 20 more containers I can use for Winter/Spring Sowing of annuals and vegetables. 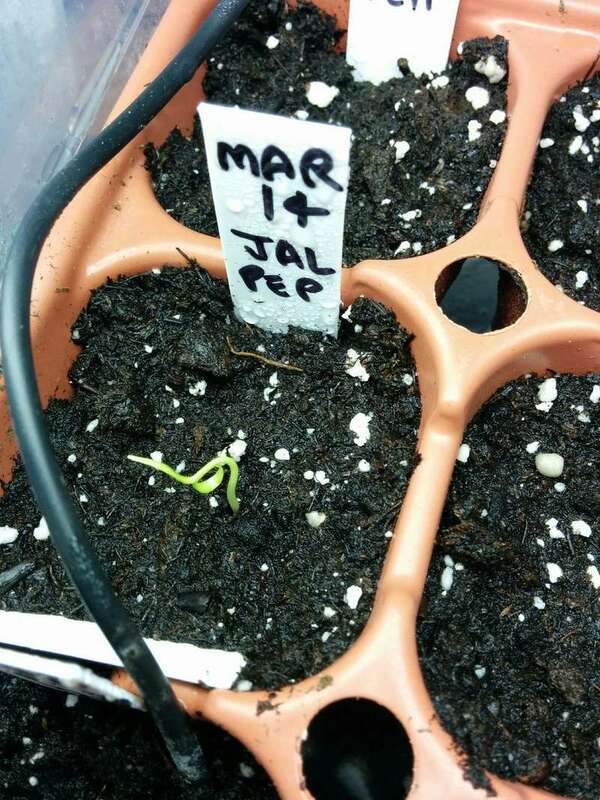 These are two Canada Crookneck Squash started indoors as an experiment to see if my saved seeds would germinate. I've up potted the plants (trying not to disturb the roots) and placed them in a sunny living room window. I wonder if Mrs TD will allow me to use the blinds as a trellis? I closed the blinds for the photograph. TD, Let me answer your question. No. @sanderson wrote: TD, Let me answer your question. No. Insert rolling on the floor while laughing emoticon here! 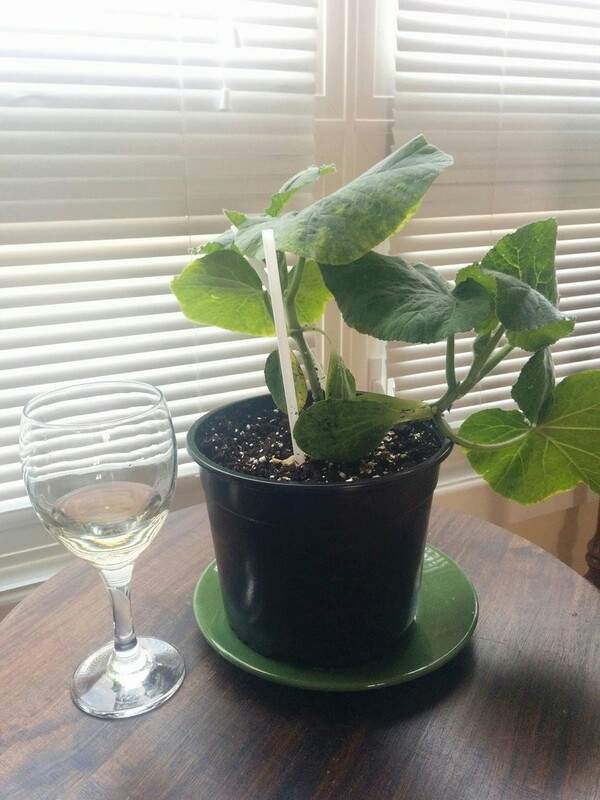 @trolleydriver wrote: These are two Canada Crookneck Squash started indoors as an experiment to see if my saved seeds would germinate. I've up potted the plants (trying not to disturb the roots) and placed them in a sunny living room window. I wonder if Mrs TD will allow me to use the blinds as a trellis? I closed the blinds for the photograph. Uh, just curious -- does Mrs. TD own a gun? I went for an x-ray on my bad knee today. Actually they did both knees because my doc thinks I have some arthritis in both knees. Lucky me. My doc also gave me a physio exercise to do at home. Follow up with the doc in May. On the way home from the imaging clinic I had to pass by a garden center where I buy vermiculite. I could not let that opportunity pass me by even with the hurting knee. I came home with a 4 cubic foot bag of large (coarse) vermiculite for the sum of $29 Canadian ($22.50 USD) plus tax. I keep telling myself I will not expand the SFG. Now what do I do? Is there a twelve step program for this SFG addiction? I've heard that the 12-step SFG program is an abysmal failure. I totally understand why you couldn't pass up 4 cu. ft. of coarse vermiculite for $22.50 USD. @sanderson wrote: I've heard that the 12-step SFG program is an abysmal failure. There has to be a deprogramming program out there for those swallowed up by SFG. Reminds me of the book I just finished, "Bow Down, Humans" by James Patterson. Can the Bots be reprogrammed? 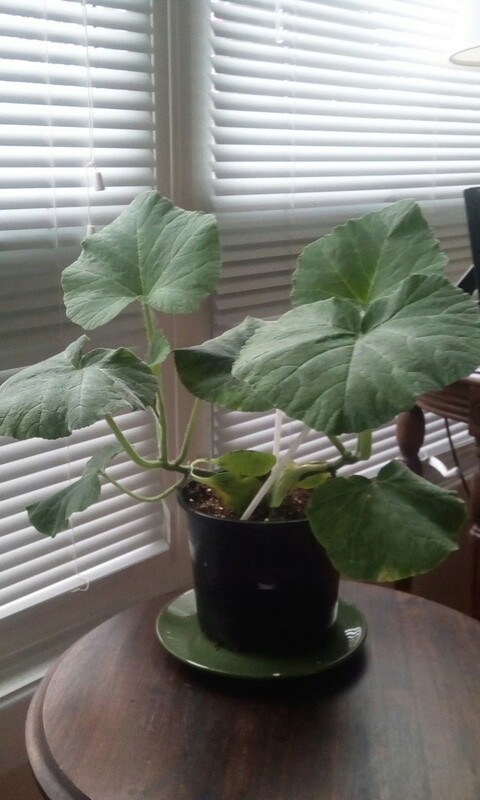 The indoor Canada Crookneck Squash continue to grow. I estimate they have doubled in size since the previous photo taken five days ago. 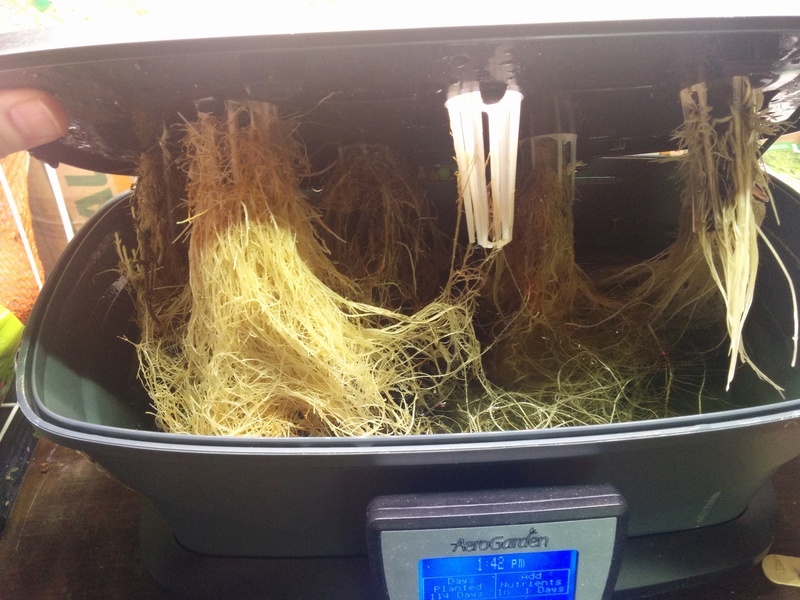 Time to clean out the AeroGarden so that I can use it without the water/pump as a timed grow light for some seedlings. 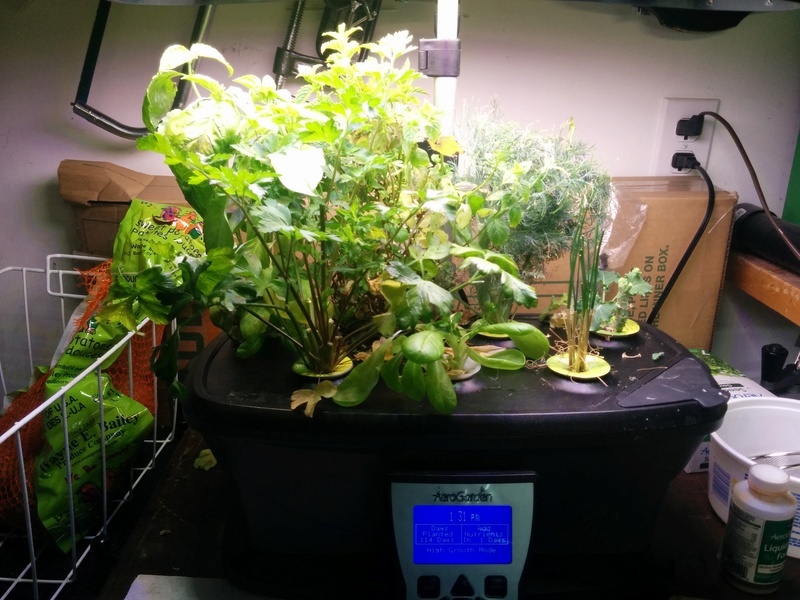 Seems like the pump stopped working and the plants were not looking good. And no wonder since there were roots everywhere. When something works too good! I hope the pump will work again. @sanderson wrote: When something works too good! I hope the pump will work again. Yup. Got it all cleaned out. 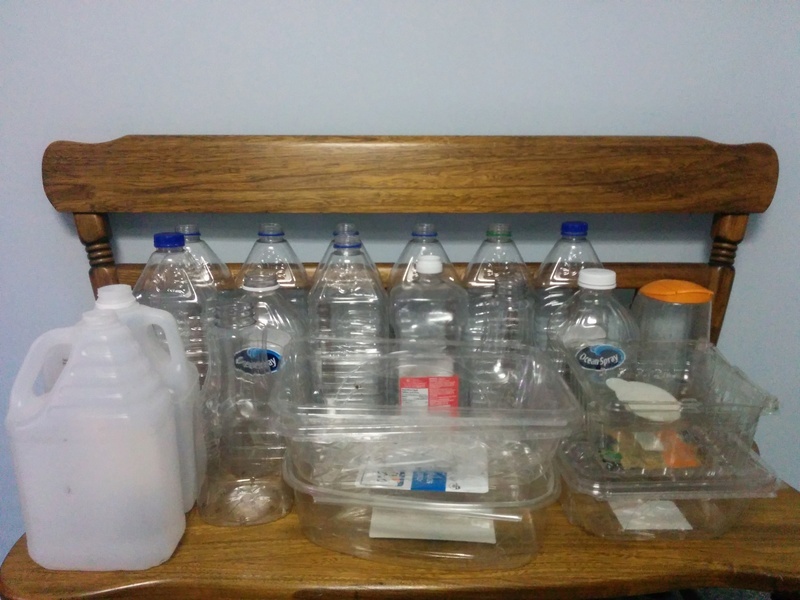 As recommended by AeroGarden I ran water with bleach though it for several minutes, followed by plain water. But I had to take it completely apart including removing the pump to get at all of the roots. 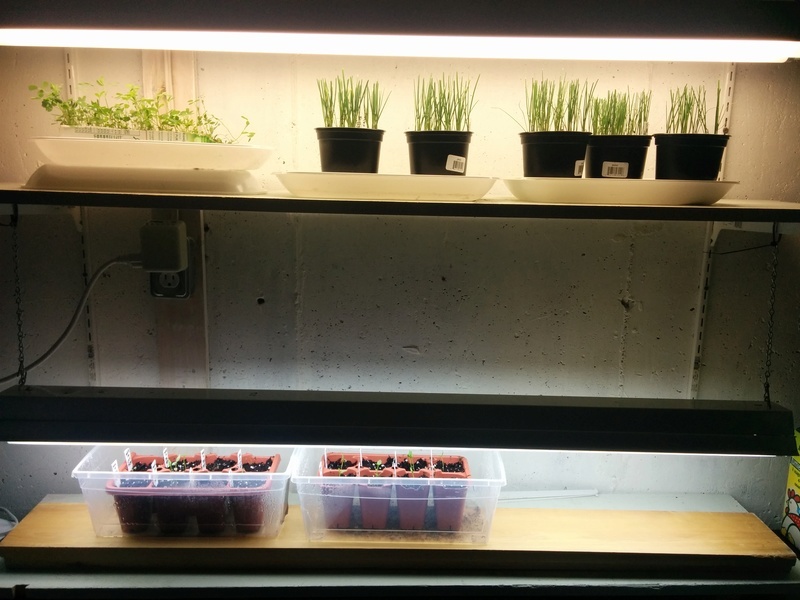 All set now to use it as a stand and grow light for seedlings. The snow and ice are disappearing but flurries are expected over the next few days. Cold here today and with high wind it feels like 19F. The SFG beds are becoming more visible including the straw mulch on the garlic and strawberries. The photo looks like nature waking up from a long winter nap. @sanderson wrote: The photo looks like nature waking up from a long winter nap. There is a lot of ice between the house and the SFG. I'm afraid to go out there with my already bad knee. TD, I looked up your weather forecast just now, and looking at your photo I am not surprised to see all the snow. I will stop moaning about my little bit of snow still on my garden, it is nearly all gone. This afternoon had two lots of snow flurries but none of it stuck. 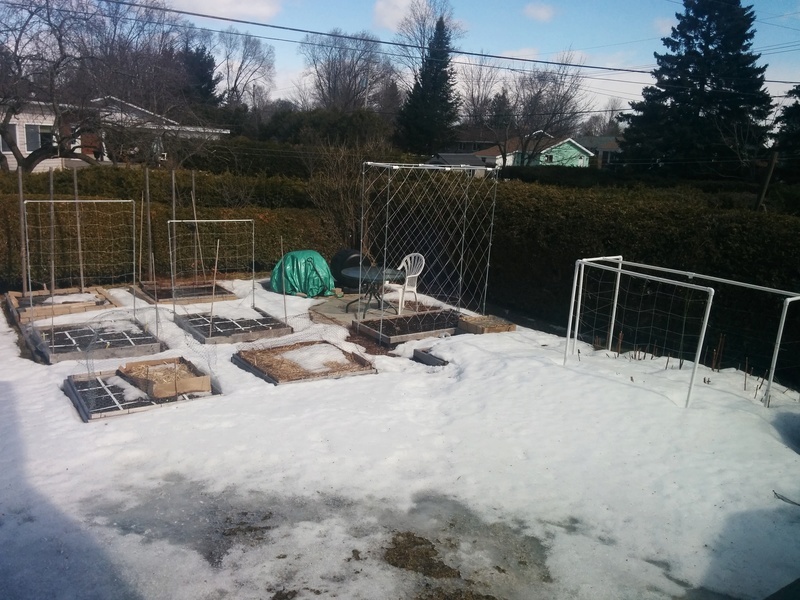 I can still see a little pile of snow on my neighbour's garden but that is where he shovelled his own snow and it is in a shady spot. All the snow he tossed on to my garden with his snow blower is gone as it is a place that gets the most sun.